Bouillabaisse used to be the soup of the poor in the port of Marseille. You simmered the bony rock fish abundant in the Calanques in a vegetable broth and added better fish according to your budget. It means boiling on low in Provençal. Today, bouillabaisse is featured in gourmet restaurants at high prices because the Mediterranean has been overfished and polluted. But it is not difficult to make your own, so long as you have time on your hands. 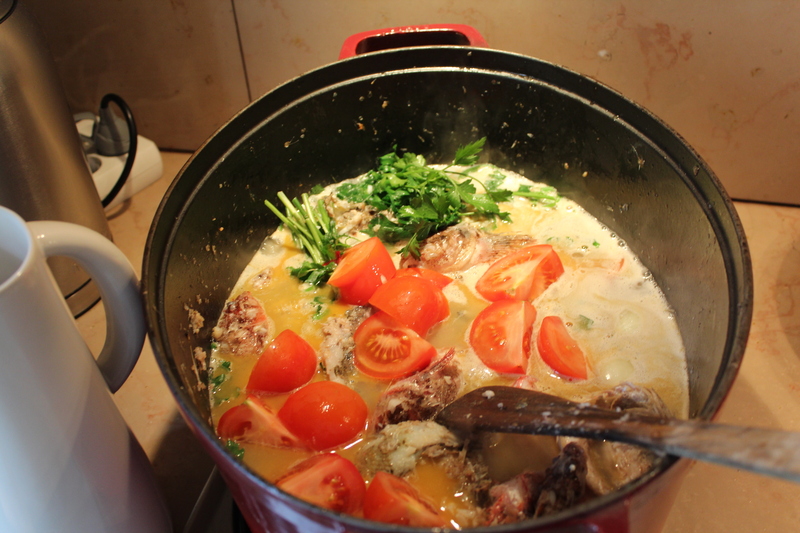 I got this recipe from Oncle Jean-Louis, my brother from Aix-en-Provence. 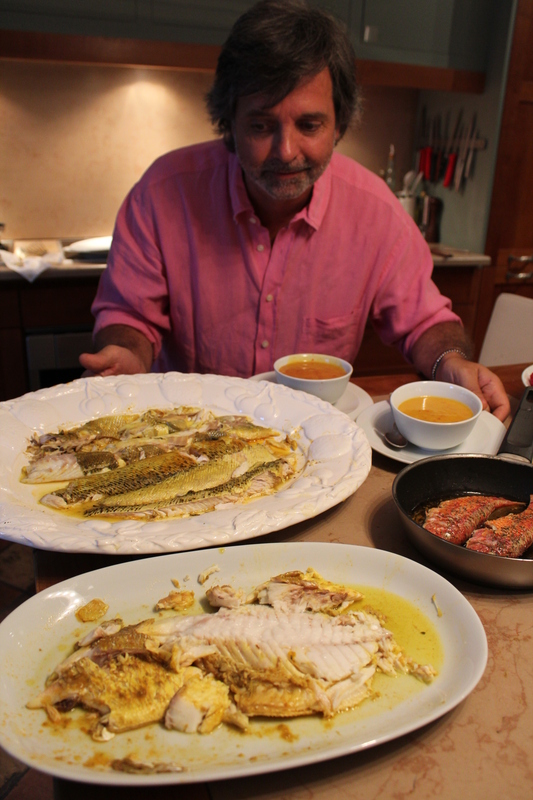 I watched him as he prepared dinner last week with the fresh fish available that day from the sea. The night before, he sauteed 1k and a half of rock fish (rascasse in French) caught on the line with olive oil, garlic, onion a bay leaf, parsley and five whole garden tomatoes. After a few minutes, he added a cup of white wine and water to cover the fish by one inch and let the pan simmer gently for one hour. He added some good quality saffron, salt and pepper and let the whole thing sit in a bowl in the fridge overnight to infuse. The next day, he strained it through the food mill, first through the coarse setting, then through the fine. And there was the soup! We are half way there. The next step was to remove about 2 cups of liquid to simmer new potatoes (without letting them boil). During that time, we prepared the “rouille” a mayonnaise with 2 cloves of garlic and saffron, and Cayenne pepper, that is very spicy. He actually used Harrissa to spice it up, the sauce usually served with Couscous. It was placed in the fridge to harden until dinner. At that point you have also grated some Gruyère cheese and you are ready to toast some thin baguette slices for croutons. The last stage is done only when the guests are here. You simmer the fish ( traditionnally, congre, vive, grondin) in the soup adding them one by one according to size so nothing is overcooked. Once all the different fish are cooked, they are boned and served on a platter. The soup is dished out in large soup plates and the fish, potatoes and croutons topped with “rouille” are added into the soup. We all seemed to vie for the “rouille” which had to be passed across the table many times. There are many variations on the bouillabaisse, other fish can replace the original choices such as turbot, monkfish, and also mussels, prawns and octopus can be added. Some people add a small piece of orange zest, or a branch of fennel, or a tbsp of Pastis and I like adding a leek to the broth. To make the “rouille” start with a traditional mayonnaise using a full cup of olive oil and 2 crushed garlic cloves and saffron and cayenne pepper or harrissa sauce. 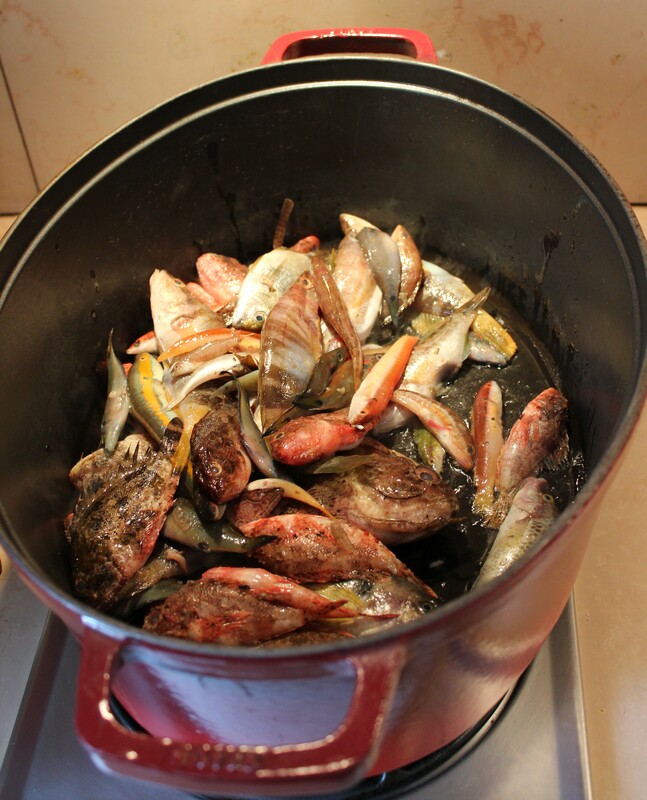 This entry was posted in Main Course, Soup and tagged bouillabaisse, bouillabaisse provencale, fish soup, food, marseille, recipe, recipes, rock fish, soupe depoisson, verygoodrecipe. Bookmark the permalink.